With the shipping industry competition growing rapidly during the start of the 20th century, many companies put out advertisements or in this case a brochure, showing pictures of the various ships in their fleet. 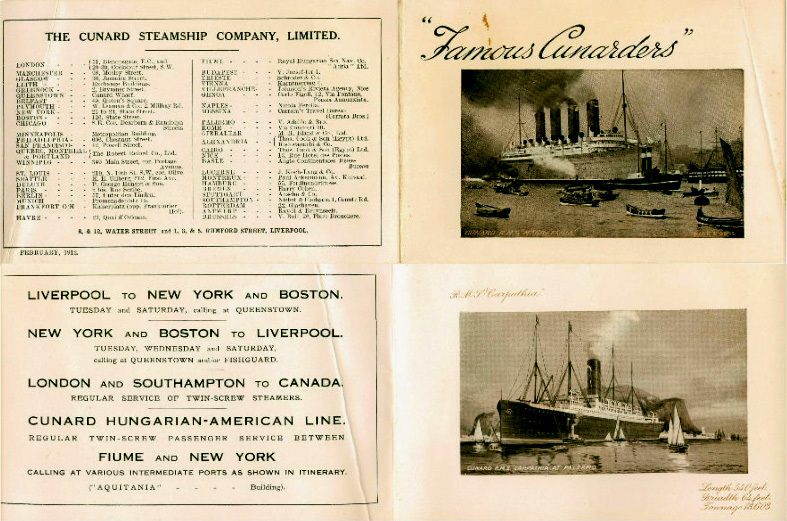 This "Famous Cunarders" ad, dated February 1912, folds out to display drawings several ships to include: R.M.S. Mauretania (cover), Panonnia, Carmania, Caronia, Saxonia, Ivernia, Franconia, Loconia, Carpathia (shown), Campania and Lustiania. Many are well known today but the most famous are the Carpathia and Lustiania.